At Academy of Hair Design, we know it’s important to identify your core values and hold them closely to every day interactions. In this series, we will be looking closely at the day to day applications of Fun, Love, Excellence and Transformation. 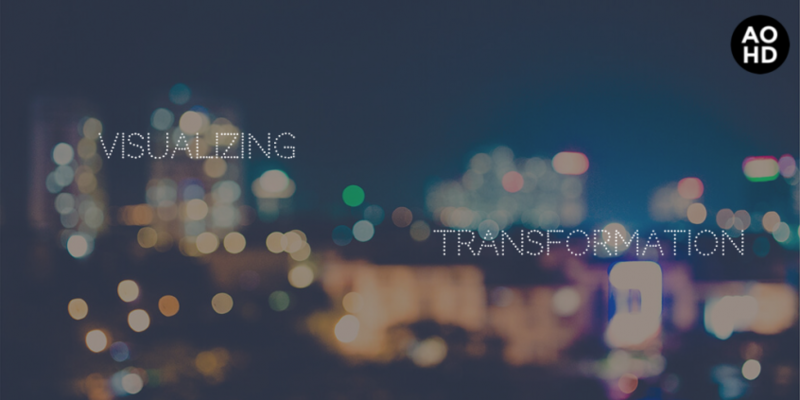 In our final article, we’ll be talking about transformation and the important components to arrive at this lofty goal. Transformation is pretty serious. To achieve a whole transformation requires change at your very core. By word alone, it’s no little thing. But what does it truly mean? It is a shift in the very core of a component of your life. It’s not an easy task. But, nothing worth doing was ever easy. Some people find a large priority in adjusting their health and seeing that change physically, some find themselves unhappy with where they are in their current state of life. No matter how visible the transformation is to be, the role mental adjustment plays is more necessary than often discussed. It’s easy to rely on tomorrow. We wake up and push off the dishes, that email you’d rather not send, or the groceries it’s too cold to retrieve. But ultimately, tomorrow is a construct. We truly can only operate in the present. If we are unwilling to step forward and do what needs to be done in the now, we may never accomplish it. Often, we find it convenient to think about changing our lives, about transformation, but we spend more time wishing after it than making it happen. This leads to a difficulty aiding in the transformation of others. It also causes a serious mental roadblock when attempting to address that we cannot control. No matter the kind of change you are seeking, the first step is always the same. It is coming to terms with your own mind. Muhammad Ali spoke often of the importance he placed on visualizing success in his fights before they ever happened. A similar sentiment was expressed by Michael Jordan as he related that he always mentally pictured his last shot before ever taking it. Positive visualization is a life-changing practice. Waking up slightly earlier in the day and focusing on this simple visualization technique, or one like it can spark the mental preparation it takes to succeed. The second step is simple in a word, but challenging in execution. When you need to get something done there is only one option to accomplishment: doing it. You could never win a fight without entering the ring. We often draw stark lines between the personal and professional, but ultimately this is a mistake. When we ignore the aspects of our everyday lives, we ignore the impact that they clearly have on our work. When we are unwell at home, it is a challenge to maintain successful professionally. Similarly, when things have overwhelmed us at work it bleeds over into our home life. We must address ourselves as a whole person, looking at everywhere we are. That is the mindset we must have to wake up earlier before work. Work is more than just an activity we go to, but an investment in our lives. When we wake up earlier and take personal time to visualize our professional success, we prepare ourselves for the best and bar against adversity. The truth is that when we are struggling with our own transformation, it can be hard to be there for others and their success. However, it is entirely necessary. In the beauty and barbering industry, there is an incredible opportunity to be an integral part of people’s lives. Whether it’s a regular haircut or special occasion makeup, each service plays a role in your client’s self-image. The co-workers that we spend our days with are also focused on their own goals and self-actualization. We are constantly surrounded by other human beings just hoping to be their best selves. Forbes recently released an article that states The Fastest Way to Achieve Success is To First Help Others Succeed. To aid others is to get our own minds into the place of success and establishing those positive relationships can beautifully shape opportunities for others to return the favor and help us as well. The goal-focused mindset demands realistic positivity. When we have that good faith at our core it makes it easier for us to support the success of those around us without growing bitter. Talk to your peers about their goals, both in and outside of work. Encourage each other to pursue excellence in everything. Sometimes this will be very hard. It is always easier to surround yourself with negativity and give in to the pressure to just complain along with the tide, but resist. When working with your clients, challenge yourself to recall details about their lives and plans. When you engage with them in this meaningful way it will reap gratefulness and encouragement for both of you. Love towards others is rewarded. Unfortunately, in life, there will be things that cannot, or will not easily, be changed. When we are faced with this adversity, we have to turn inward. We have to change ourselves. It’s important to be honest with yourself about the situation that you find yourself in. Sometimes it’s appropriate to learn that we need to change our situation. Sometimes we learn that there are things that we cannot control. There are plenty of things that we cannot control in life. Positivity is infectious. When you have established valuable relationships of support with those around you, they can come to your aid when you need it. If you find yourself in an unchangeable situation, visualize it. Decide your next route. Reach out for support. Then begin doing what you can to move forward. Accept that sometimes, just taking care of yourself is all you can do. Decide that that is enough. Transformation is a strong thing to value. As members of the beauty and barbering industry, we deal with physical transformation all the time. But to truly place this accomplishment into our own lives, we must also work with the other values we have previously examined. Fun, love, excellence, and the way we approach them help lead us to the final destination that is achieving that personal transformation and making the most of what we’ve been given every day. And when you are doing your best it truly can be FELT.